Welcome to day two of my California adventure series. As I mentioned in my previous post, my friend Macon was in charge of coordinating the hiking trips. A little bit about Macon - he is an experienced and skilled Appalachian Trail thru-hiker. This means that he accomplished hiking an entire long-distance trail from Georgia to Maine in a hiking season. In summary, the adrenaline rush and thrills of the forest runs through his veins challenging me to keep up on the trip. I, on the other hand, have very limited hiking experience. Anyways, onward with the adventure. We began our expedition bright and early in the morning in hopes to avoid traffic going into the city. Mission accomplished. The journey from Santa Monica to Sequoia National Park took roughly five hours. But it honestly didn't feel that long! Not when you drive through the most epic mountain views along the Golden State Freeway and the lovely, verdant valleys off North 99. Four hours later, a quick pit stop at Subway for cheap, good sandwiches to take with us into the park. This was a small town close to the park. First hike on the itinerary, Congress Trail. Below is a photo of me standing in front of the world's largest tree, General Sherman Tree!! Last but not least, Tokopah Falls. Real talk, I was EXHAUSTED by the time we reached the beginning of this hike and didn't want to do it at all. It was near a campsite which really concerned me due to the possibility of black bear sighting. On top of that, it was raining, getting dark, and there weren't other hikers on the trail. I put on my big girl game face and just did it even with my stomach doing back flips. Was it worth it? I'll let your perception of the photo below be the judge. We took a photo under this super cool fallen tree (RIP) and couldn't understand the commotion of people and cars behind us until we spotted a baby black bear hanging out on the patch of green grass. So adorable yet frightening! We stayed in the car, snapped a few blurry photos and rushed off before mama bear's arrival. 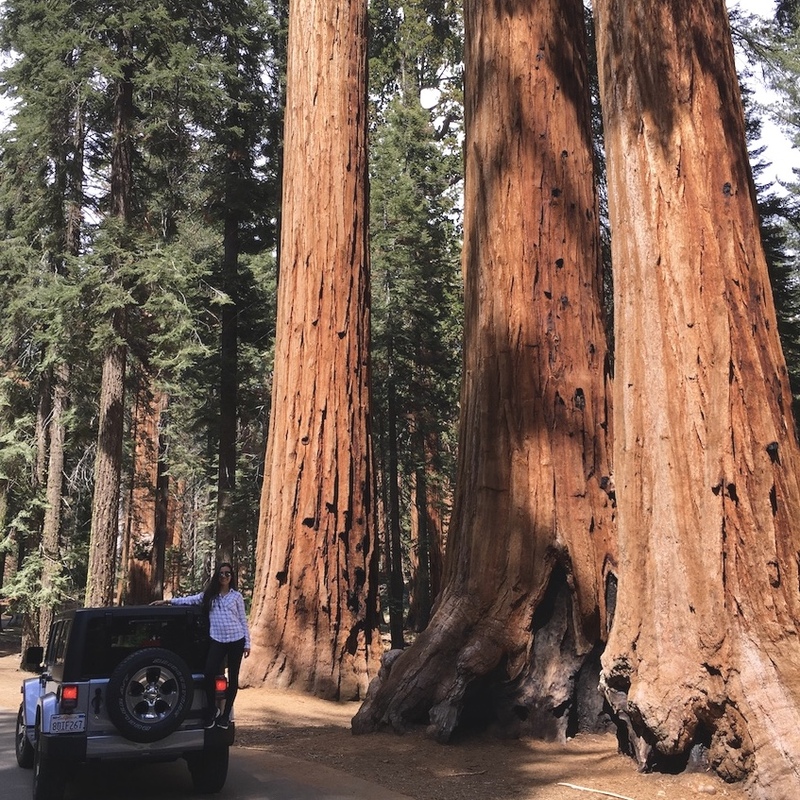 So tell me, friends, have you ever been to Sequoia National Park? Do you like to hike? Would you add this national park to your bucket list? I'm still creep'ed out by that fire trail because there was a random, "odd" looking doll hanging off one of the trees, but have mouth-watering memories of that Subway sandwich.